There was a time not too long ago when I put arugula seeds into a little ceramic pot in my sun lit kitchen window. I could grow a small amount of arugula, just enough to add a hint of taste here and there to a sandwich or salad. But recently arugula has become available in all the grocery stores and I can enjoy it whenever I like. It’s got a unique spicy taste that I love and has become one of my favorite pesto’s to make. 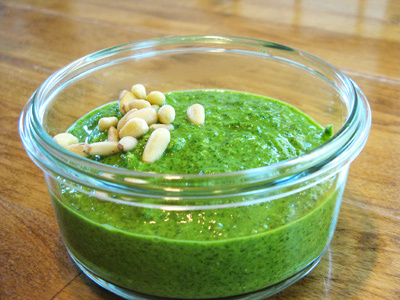 This arugula pesto sets the stage for upcoming recipes. Hope you enjoy! You’ll need arugula, spinach, lemon juice and zest, pine nuts, minced garlic, parmesan cheese, red pepper flakes and olive oil. Pack into a food processor and generously drizzle olive oil over the top. I have a small food processor so I can’t pack it all in at once. Pulse until you get a rough chop. Drizzle olive oil and continue blending until you get the desired consistency. Salt and pepper to taste. So simple, yet so tasty. Here’s a fast easy bruschetta. 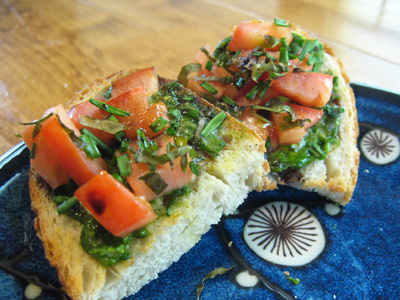 Toast a slice of your favorite artisan bread, slather it with arugula pesto. Top with tomatoes and any fresh herbs or even dried ones will do. Drizzle some balsamic vinegar and olive oil over the top and toast for 3-4 minutes. Sometimes I have it for lunch. 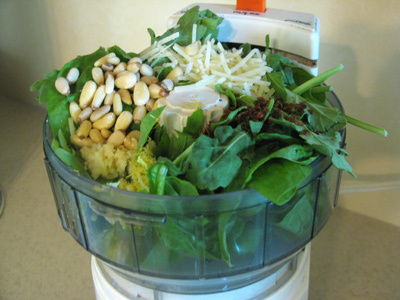 Place first 7 ingredients in a food processor. Drizzle olive oil into mixture and pulse until you get a coarse blend. 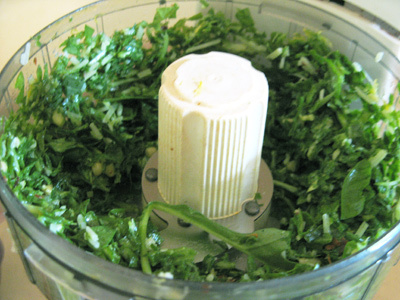 Continue to drizzle olive oil while processing until you have the desired consistency of pesto. Salt and pepper to taste. May be refrigerated for up to 2 weeks. This is a really tasty idea. I love arugula (rocket here). It has such a delicious, peppery flavour. Thanks much for leaving me such kinds words. 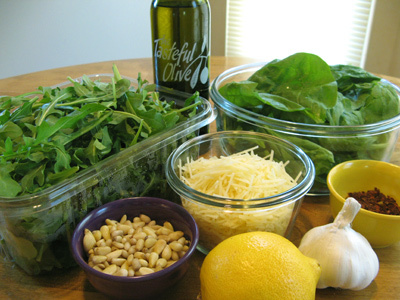 I love arugula too and hope you enjoy looking at the upcoming pesto recipes.